Discussion in 'Member Introductions' started by Picard, Oct 16, 2018. I came here to find a good quality ink and more about the pro-100. I used to use MSI ink (think it was called), but over the years it poofed and I began to use whatever the heck I could find. I really didn't know much about what I was doing, but I had learned to refill with minimal mess by top filling, both ball removal and drilled with plugs, flushing and cleaning print heats, and the like. My previous group of printer(s) was the Canon IP3000. I probably burnt through maybe 3 or 4 of these. Eventually I always managed to burn out print heads, and just about a month or thereabouts ago, I burnt out my last one. I have a crappy all-in-one Canon MX490 that I got for like $35 that I use and it works fine, but I had to get a good-enough photo printer. I found out that Adorama had a thing going on with a canon rebate on the Pro-100 so ordered one and sent in my rebate (still in the pipe-line so we'll see if canon goes through with that one). Needless to say, I was (am) a bit intimidated with this printer, but while seeking information about this monster, I found your website and was elated to find out this was a good printer. Someone posted it was a big "pussycat". I also found out about the delicacy of Canon print heads if they aren't treated with respect, and the very reason I probably burnt out all those ip3000 printheads. I didn't refill in a timely fashion and not only burnt out the print heads but I know on one probably the main board. The one I just took down was giving me the five flash, so maybe just a new print head... Anyway, now I know, and now I am a bit paranoid, prolly a good thing. Hi @Picard, welcome and glad to have you on board, now that’s what I call a real Introduction. WOW, who'da thunk? Neils one smart feller, hell I even painted my car hood using his method. That was a blast! edit: I meant 'nerd' in a good way Neil! Welcome to the forum, Picard. The Pro-100 can make superior Dye-based ink images and will last if you take care of her. To keep the printer in good working order... use it, the more the merrier. Try to print something at least once a week or so that uses all the cartridges to decrease the risk of clogs. A nozzle check will do. Never let a cartridge run out of ink. Canon print heads heat up the ink and spit it out. The ink acts as a coolant. Lack of ink and nozzles begin to burn up permanently. Anytime you see a loss of ink -- STOP printing. Nothing but nozzle checks until you resolve the issue. Sometimes it is a clog. Oftentimes it is ink starvation due to poorly functioning refilled cartridges, which then may be flushed and refilled and put back in use. The forum wisdom is to refill when the cartridge is marked as LOW, not Empty. This way there is always ink in the sponge and the sponge does not begin to dry and gum up leading to poor ink flow. 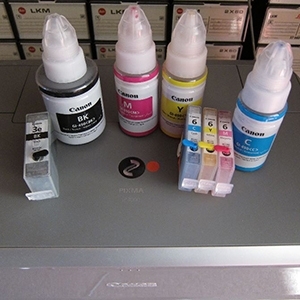 Lastly, for quality ink and refill supplies go to Precision Colors. It's out of Canada and the owner is a forum member, Mikling. turbguy, Picard and The Hat like this.